My dog says he is beyond excited for Puppy Tweets to hit the marketplace this fall. 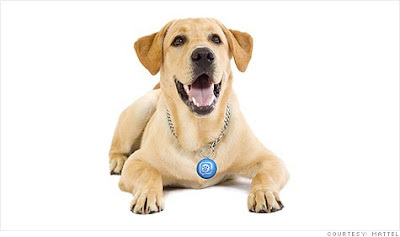 This innovative gadget is a tag that attaches to your dog's collar which allows him/her to sent tweets on Twitter. Yes, tweets! If you dog is running around the house, the tag senses the activity and sends a tweet that says something like "I finally caught that tail I've been chasing and OOOUUUCH!" If your pup is napping, the tag will trigger your computer to send a tweet that may say, "Sometimes it feels like my paw is permanently on the snooze button!". Puppy Tweets is being manufactured by Mattel and will retail for $29.99. 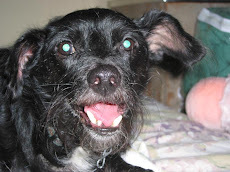 To read more about Puppy Tweets, click HERE. Deb: I suspect you're a Twitterholic like my mom. All you crazy Twitter people want us animals to be as hooked as you! I'm a dog of few works, so 140 characters should do me just fine. Woof (see that's only four)!